"It suddenly appeared a classic comet shape, a white ball with perhaps yellow eges and a bright white cone tail out the back. The person I was with saw it too. It was only there for a second. I never expected to see such a sight from my garden." Billy Dymond saw it from North Devon. He said: "We watched if for around three to four seconds, a large white ball turning green, not just going across but falling downwards towards earth at an incredible speed." The meteor was spotted in Toronto, Newmarket, Oshawa and as far away as Sudbury around 10 p.m.
Several people reported the meteor on the American Meteor Society’s website. There was no sound associated with the meteor. It is unknown if the meteor is associated with the Delta Aquarid meteor shower that peaks on July 30. Typically the Delta Aquarids produce about 10 meteors an hour. More than 200 people from Indiana to Ohio southward toward North Carolina reported seeing the large fireball. Most of the sightings came in just before midnight and folks reported the it was traveling from south to north across the sky. The meteorite was described as bright white with some red. There were no reports of sounds as it passed by the area. Three Major Meteor Events 13/14AUG2013 - Little Coverage in Major News Outlets?? The sight of a giant shooting star left a North Taranaki man shaking after his early morning run. He said the star had completely lit up the dark moonless sky and surrounding countryside. Orbital estimates pinpoint 20 asteroids on similar paths to rock that exploded near Chelyabinsk. Breaking News - Hawley, TX Bolide Fireball Meteor 13AUG2013 - Perseid? MBIQ Detects MD VA Meteor 18AUG2013? The system, which is a multi-station radar, tracks satellites, meteoroids and space debris that is heading our way. The radar stations are scattered across the southern USA and can detect objects some 25,000 miles away from the Earth. The tracking devices form a crucial part of our defenses against all types of space matter likely to cause damage to the planet. According to two recent memos obtained by SpaceNews, the Air Force will shut down the aging Air Force Space Surveillance System, also known informally as the Space Fence, Sept. 1. MBIQ Detects MD VA NC Meteor 19AUG2013? San Luis Potosi, Mexico Daytime Bolide Meteor 21AUG2013? Very Strange! This asteroid event was near the size of the Chelyabinsk, Russian event and yet I cannot get any news from Mexico Media or help from Mexican astronomers??? Four independent videos documented the event yet I cannot get help to obtain the ORIGINAL videos? Please other country scientists and researchers help with this study. Did the ET aliens throw another one at us? I am still calling this event REAL in spite of the skeptics. CONCLUSION- Mexico "Meteor" EVENT FAKED! MBIQ Detects Slovakia Meteor 24AUG2013? NASA's All-Sky cameras captured a very bright meteor burning up in the atmosphere at the same time that the Moon was in the camera field of view. Early estimates: meteor weighed ~100lbs and was traveling ~53,000 mph. IMPACT THREAT LEVEL RED 09/01/13 to 09/13/13 Wormwood Impact Vision 7 Oct. 2012? Italia Bolide Fireball Meteor 03SEP2013 with Sonics! MBIQ Detects IL MI Meteor 06SEP2013? Breaking News- GA AL TN MS Fireball Meteor 09SEP2013 with Sonics! Tataouine , Tunisia Large Meteorite Fall with Explosions? 15SEP2013? Unconfirmed! MBIQ Detects NS NB ME MA NH Fireball Meteor 17SEP2013? The AMS has received nearly 700 reports of a large fireball this morning September 26th around 7:05 am local time. Witnesses from Ohio, Illinois, Indiana, Kentucky, Missouri and Wisconsin reported a bright light moving across the morning sky. The mid west has witnessed two major fireball events in less than 2 days. The second Fireball occurred last night September 27th around 11:30 PM local time over central Ohio. The AMS has tagged over 450 witness reports to this event so far and there are still over 400 awaiting review. This event has quickly become the AMS’s 3rd most reported event of all time. The Indiana event that occurred earlier in the morning attained the second place spot, but its possibly that title will not be held for very long. Hundreds of witnesses continue to report this latest event in Ohio. Here is an amazing photo by Alex Parlini of the Ohio Meteor (AMS Event #2132) this past Friday night. This event logged over 1000 witness reports and goes down as the 2nd most reported event in AMS history. This is a crop of Alex’s image, click the pic below to see the full size shot. A fireball reportedly hit near a home in northern Adams County, Ohio, a few miles outside the city of Peebles causing a house fire. . . . A neighbor said the meteor crossed over the city and hit near the Locust Grove Cemetery just four miles from the Great Serpent Effigy Mound. In recent years, a crop circle appeared overnight in an adjacent field from the Serpent Mound grounds and thousands of years ago it was the sight of a major meteorite that caused a huge impact crater. The latest event took place over Alabama and Georgia last night September 28th 7:30 PM local time. Over 250 witnesses from Virginia, Maryland, Kentucky, Tennessee, North Carolina, Alabama and Georgia have reported the event so far. Below is a heat map of the witnesses who saw the event. Click the image below for the event detail page and witness reports. For two days now, villagers and authorities in the west coast of Zamboanga remain baffled after a big ball of fire streaked from the southern skies at 5 a.m. on Wednesday, hitting the coastal water before exploding and illuminating nearby villages. Brazil Weird News: Weird fireball falls from the sky at Yucatan - September, 22 - 2013. At Ichmul, Chikindzonot city, south of Yucatan peninsula - Merida's state, in a poor community where live some remnants of mayas, the fall of a fireball that came from the sky, scared and still is scaring the dwellers of the place. 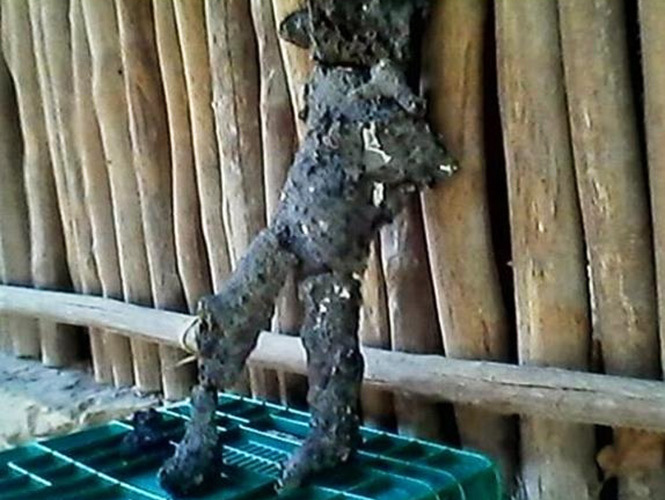 The researcher of the Instituto Tecnológico de Mérida, Eddie Salazar Gamboa said the object are meteorite fragments or debris (human trash) attracted by the gravity of Earth and warned that direct contact with them may be dangerous to humans. However, urged people don't must have contact with these objects because they may contain radioactive material and, eventually, can cause certain types of cancer. knocked from the sky by meteors. MERIDA, September 29. - The fall of a ball of fire that lit up the skies of the southern Yucatan caused fear to a Mayan community located in one of the poorest areas of the town. Ichmul In the village, township police of Chikindzonot, the locals were about to enjoy a small circus performance in the center of the community, when he suddenly saw an object in flames falling from the sky at great speed. The view was so bright that none of those who were were left to observe the glow that was broken when he was about to touch down, similar to a pyrotechnics blast. happened Falling Object at 8:30 pm on Sunday, breaking the monotony of this small town . At that time the blast caused the electrical current is suspended, raising fears because in the drop zone flashing blue blazes were observed. while women crossed themselves, the municipal commissioner, Pech Koyoc Floro said that the drop object, a loud bang was heard in the entire population, and immediately observed how in the bush out a beam of light that lasted until about 2:00 in the morning. "When that thing down there was a loud noise, like a welding machine, which remained until three in the morning, some climbed to the roof of the church to see what it was, and only saw a light in the forest that even thought it was burning ". "People are frightened because I did not know what it was and feared that the fire came to the town, and later, began to despair because the light was fading and growing again, "expressed the young, who described how the dogs would not stop barking. The boys said they the strange illumination of the object is able to observe to the neighboring towns, like Saban, Quintana Roo, San Francisco, Peto Chikindzonot township. Not coincidentally humanoid figures forming when piecing together. Apparently it was a UFO that had a mechanical failure and fell to the ground with his crew. The subject of UFOs and other possibilities of life in space are many. More and more things are discovered. This topic is not for ever. 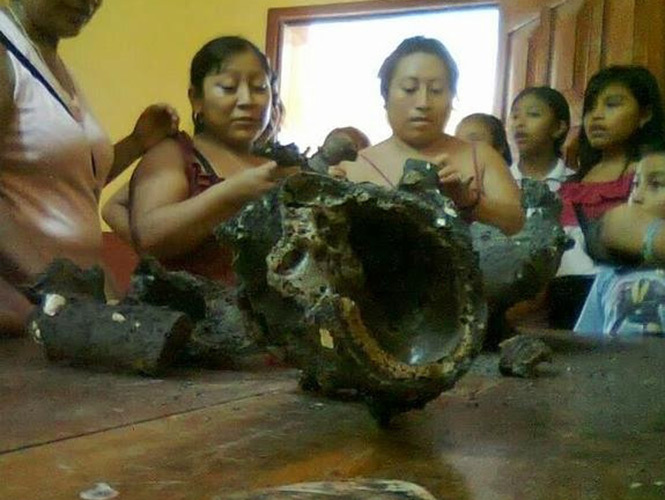 It would be good to know that they are really doing with all the remains they found. That did not seem strange that the Yankees appear to want to take them. Sunday evening, a weird sky phenomenon broke up the monotony of a small Maya Town as a huge object, thought to be a fireball, lit up the skies over the town of Ichmul in southern Yucatan at around 8:30 PM local time. The falling object was accompanied by a strong thundering noise and a loud blast when it crashed onto the ground. The crash was followed by flashing blue hazes and a power outage. Than flames were observable until approximately 2 AM at the object’s landing site. The sky phenomenon was also observed in Saban, Quintana Roo, San Francisco, and Peto Chikindzonot township. Will meteors, asteroids or comets be what eventually drives the human race to near extinction? Does the government know something huge is coming? Is that the reason for the massive preparations being made by FEMA, and the CDC, or the reports of body bags for a supposed possible “tsunami” as Live Free or Die wrote about just this morning at Beforeitsnews? A video reports that between 200 to 300 fireballs have been reported in September, but none have yet to land. More reports of meteor sightings on Friday night are coming in from Indiana. Nearly 700 people across six states already reported sightings of meteors Friday morning. According to AMS, September has had 13 significant meteor events. That's more than any other month since collecting reports of fireball sightings with AMS began. It’s more than rumor – it is happening. Too many people are confirming this - something huge is underway in Puerto Rico, and the military is being told it will be a meteor strike. As we reported yesterday, meteor sightings are coming into the American Meteor Society by the thousands. Interestingly, there are reports of meteor sightings from 40 states, including Atlanta, GA, Alabama, South Carolina, North Carolina, Kentucky and Tennessee as of September 28, 2013. However, what wasn’t reported by the mainstream media was the fact that these meteor showers coincided with an asteroid narrowly missing Earth. Newfoundland, Canada Fireball Meteor 11OCT2013? MD NY MA DC Fireball Meteor 14OCT2013? Fireball meteor lights up aurora display over Scotland - 15 Oct. 2013? Second fireball meteor spotted over northern Scotland? - 16 October 2013 The second meteor could be seen from Inverness, Ullapool and also Tarbert in Argyll at about 19:00 on Tuesday. On Monday, a display of the Northern Lights over the Highlands and Islands was lit up by a fireball meteor. Amazingly, he has since discovered that the phenomenon he recorded was a different fireball - meaning there were two within 50 miles of each other at around the same time. Bosnia-Herzegovina Fireball Meteor 01NOV2013 - Possible Meteorites Produced! November 3, 2013 Sunday at approximately 1:45 a.m. while approaching the entrance of Saltillo, MX. From Monterrey, we suddenly observed what looked like a streak of light of red and blue? The National Weather Service says the sightings reported starting at about 8 p.m. Wednesday night are “most likely associated with the South Taurids (TOHR-ids) meteor shower that has been especially active in early November.” Astronomers say the Taurids doesn’t bring big numbers of visible meteors but a high percentage of extremely bright ones that LOOK like fireballs. One documented sighting came via the dashboard camera of a vehicle in a car park, which showed a grainy ball of light moving across the sky. A meteorite falling in the areas bordering Bangladesh created panic among the residents of the Garo Hills region. The meteorite, which fell inside Bangladesh, lit up the night sky around 10.30 pm last night. It was eagerly watched by the residents living along these areas. OK TX KS MO CO NM Fireball Meteor 16NOV2013? A strange, fiery sight spotted in the skies over the Willamette Valley Wednesday morning may have been a meteor. Or an optical illusion. A meteor hit Zakynthos, the third largest Greek island, in the Ionian Sea on Wednesday night. Lawrence Parkin from Jacksdale, Nottinghamshire said he was woken in the night by a tile falling from his roof. In the morning he found large chunks of rock scattered around his front garden. There is a huge meteor streak, in the Northeast, at Neumayer Station, in Antarctica; which is lit up by the moon. ISON was in the Northeast sky that morning in that direction. I am wondering if this isn’t debris from ISON? There are several streaks shown in the sky, that evening. The date is December 10, 2013. Could be meteors coming through and the sonic booms were from them entering the atmosphere," said resident Janet Johnson. Daytime fireball spotted over Sweden yesterday and another over the UK this morning! Major firebal activity and amazing dramatic footage, presented by Fire in the Sky News, with 14 fireballs reported and shown at SpaceWeather.com, with 4 major events reported in just 5 days. In the last 6 weeks, there have been 54 fireballs reported, bringing the grand total for 2013 to 315…and counting. For comparison, in 2008, there were 69 fireball events for the entire year. In 2012, a total of 246 fireballs were reported around the world.